It’s barely three o’clock in the afternoon, but I already feel like this is one of the longest days of my life. I’ve been walking down this path for some fifty minutes now, and I have literally no idea where I am. And there is literally no one to ask for directions. 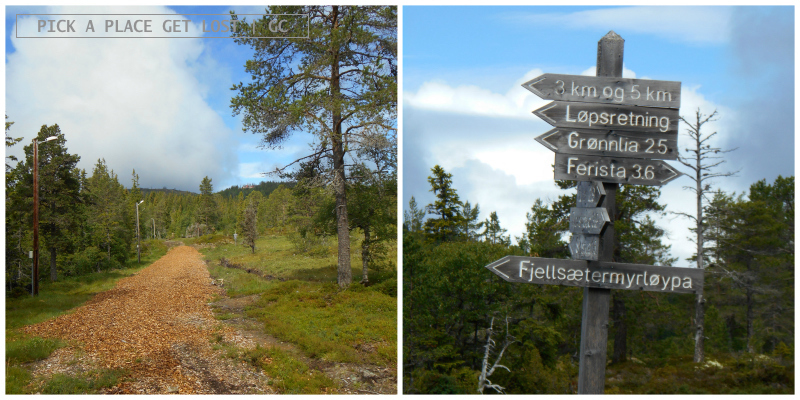 A couple of hours ago, after leaving the Grønnlia hut, I went downhill toward the lake Skjellbreia. The view was stunning. There was a glare, so the water looked like it was made out of silver, and melting with the sky. Tiny blue dragonflies were flapping all over the place, and a tiny wooden bridge looked like it had been placed there to provide the hiker with the perfect snapshot. Soon, however, it no longer felt as idyllic: the path grew very narrow, and there was mud everywhere. That is when, for the second time in a bunch of hours, I cursed the moment I didn’t pack hiking boots or, at least, running shoes. 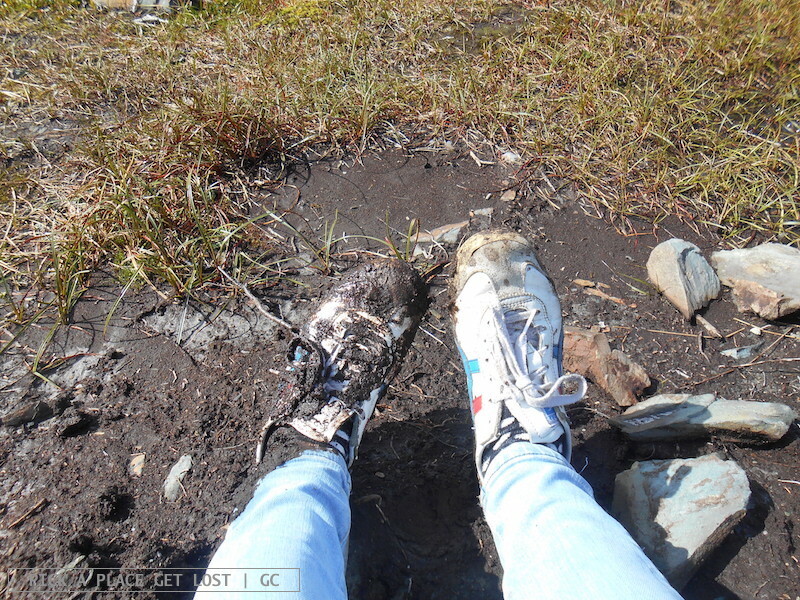 So here I am, in the middle of Bymarka natural reserve (around two kilometres west of Trondheim) after a night of heavy rain, wearing a worn out pair of Tiger sneakers. I’ve had soppy feet virtually since I’ve been around the reserve. Back at the hut I checked wooden signs pointing uphill. ‘Skistua’, read one of them. Skistua is, alongside Grønnlia, one of the most popular Bymarka spots. That’s where I’m heading for, I thought. The trail was rather demanding, but simply stunning. I walked up this steep, narrow path covered in muddy earth and roots. The roots were thick, web-like, now and then forming sort of nature-shaped stairs leading uphill. Had it been sunny (which it wasn’t), I wouldn’t have noticed anyway, so thick were the branches above me. I could barely see the sky at all. 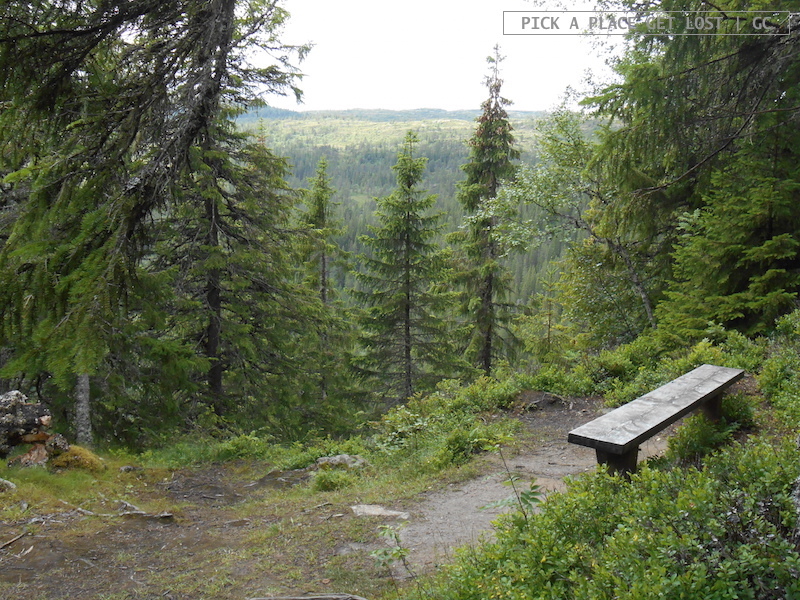 After nearly two kilometres uphill, the path went down. More ‘Skistua’ signs. 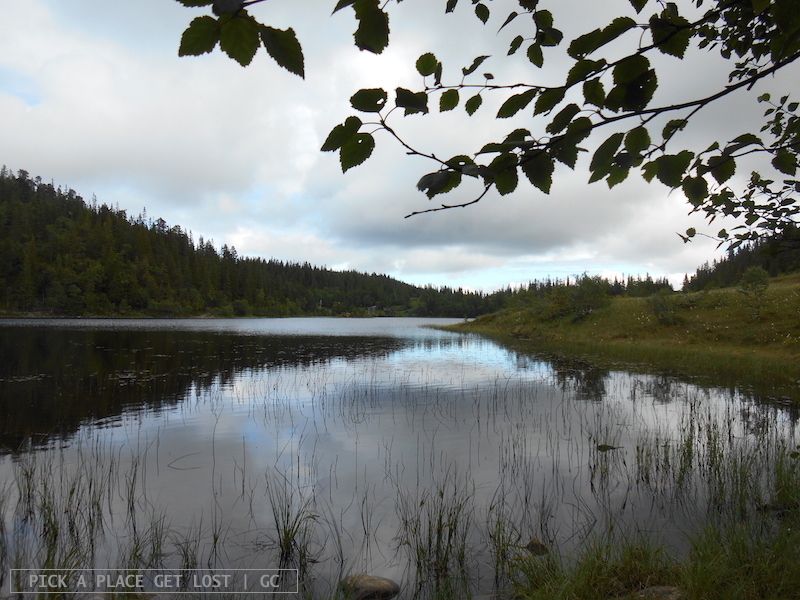 But there, on the left, was another lake. Vintervatnet, I guessed. I ran to the shore, and dipped my hands in the cold, transparent water. Standing by the lake, I looked around to take in the immense, borderless nature surrounding me. 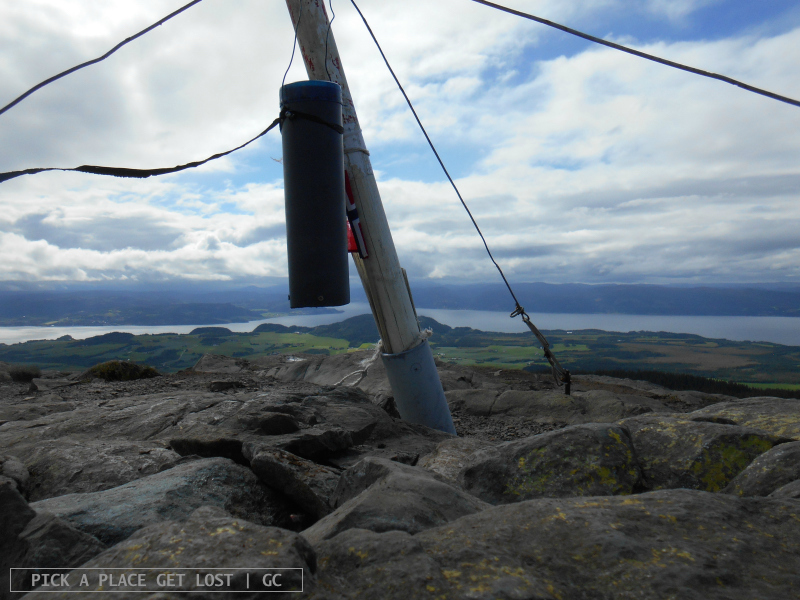 The only human traces visible to the eye were the cables of the ski tow (now closed) beside the lake. 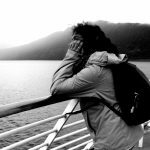 The silence of nature was hugely powerful and belittling. I’d have loved to stay longer, but because I had no idea where I was, and it would take me a while to find my way back, I chose to return to the path. 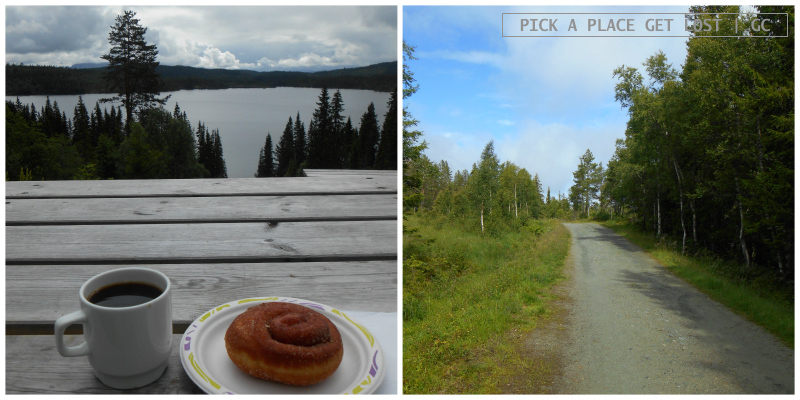 Except, I obviously and expectedly failed to return to the Skistua trail I was following. I found myself strolling down a broader path covered in tiny gravel instead. So here I am now, at the point where I’ve no clue where I’m going. The sky is now overcast, I’m expecting heavy rain any minute now. Suddenly, signs reappear. 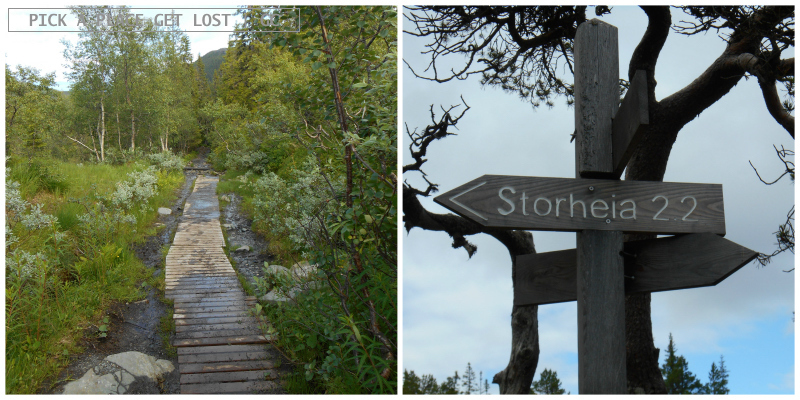 As I’m carefully scanning the orderly wooden rows of place names, I see it: ‘Storheia 2.2[km]’. Here it is. The highest peak in the reserve (565 mt). 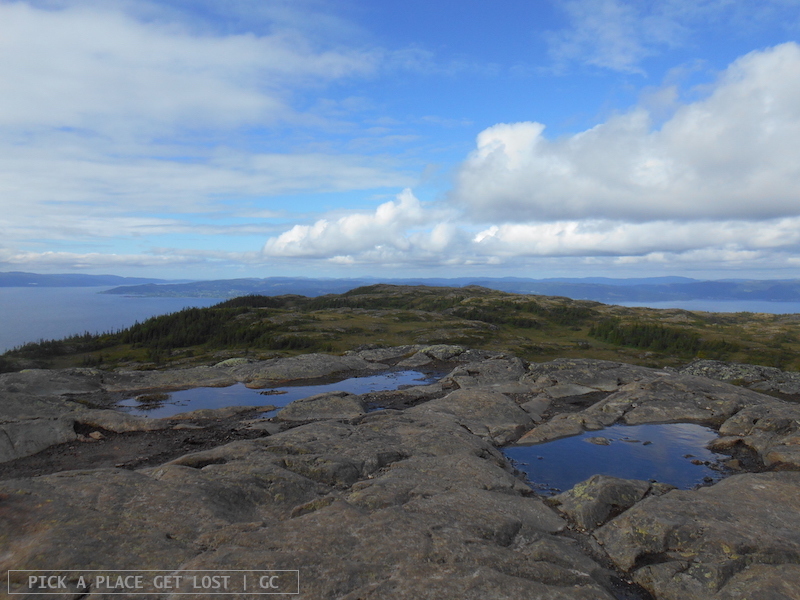 I’ve secretly wanted to go up Storheia all day but, not having hiking boots, I thought I would make do with other trails. But hey, I wasn’t looking for this sign, it’s the sign that coincidentally happened to find me. There is no hesitation, not one second. Go. The next forty-five minutes consist of the following. 1. Mud, mud everywhere. Even the wooden boards covering the muddy ground along the muddy trail are covered in mud. 3. The sky. The sun is now shining bright, it’s so warm, and the sky gets bluer and bluer as I approach the top. I’m too focused on the steep rocks to stare at the sky for too long, but every now and then I have to look up. I can’t miss it. 4. You know when you’re hiking to the top of the mountain, you’re almost there, and when you get to a flat spot, you’re like ‘I’ve made it!’. Except, as you turn around to congratulate yourself, you see the actual mountaintop fiercely showing off on your left, the tiniest Norwegian flag fiercely flapping on the very top. 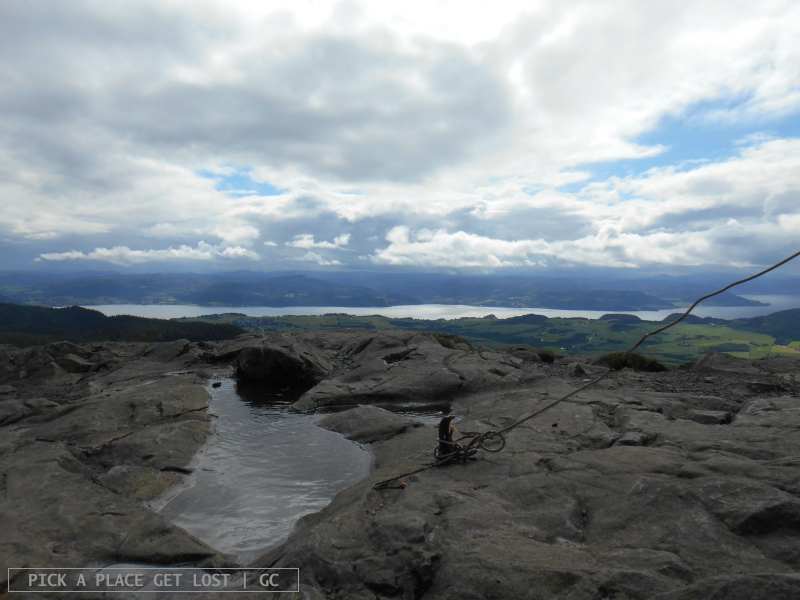 ‘Oh wait, that is the top!’, I say aloud, as I head for the top (for real, this time). I really am laughing with myself (kind of laughing at myself to a certain extent) when I finally make it. This is beauty in its purest form. I am standing, completely alone, on the top of the mountain. The wind is strong, whistling powerfully in my ears. The mountains are green, covered in trees, with random rocky patches here and there and a couple of lakes that look deep blue from a distance. The air is clean, transparent, faithfully mirroring the clear, blue sky. The immensity of the 360-degree view from a mountaintop cannot be put into words, I’m not even attempting to do that. It is so utterly stunning and breathtaking. I feel so belittled I can barely stand. I mean, literally, I’m sort of awkwardly crouched, hands tightly clutched to the rocks. I keep turning my head back and forth to make sure I’m not missing anything. It takes me a good fifteen minutes to regain some composure. Then, after one last look at the horizon, I hurry back downhill. When I finally make it back to the tram stop I am so overwhelmed by the past eight hours I cannot believe it has really happened. If I went back to Bymarka I would wear hiking boots the whole time and I would clutch a map of the reserve in my hand the whole time. Usually I am a better hiker. But let me say, oh the beauty of discovering places as you come across them. The beauty of not knowing, for once, everything in advance, and not missing it. Norway is my safest haven, and it’s one of those places where nature looks at its best. Rocky mountains meet salty water, and everything looks like it’s perfectly in place. Bymarka seems to be there to prove it. 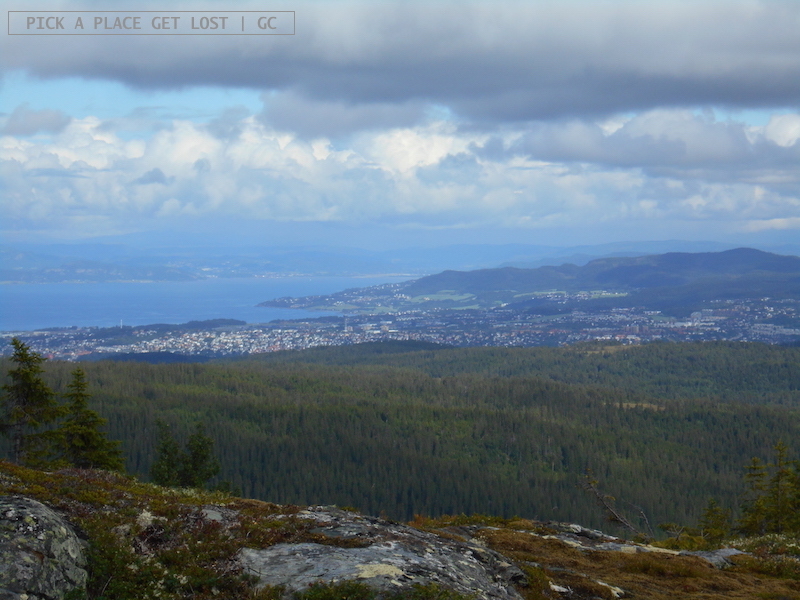 Mental notes on how to get there: from Trondheim city centre take tram no. 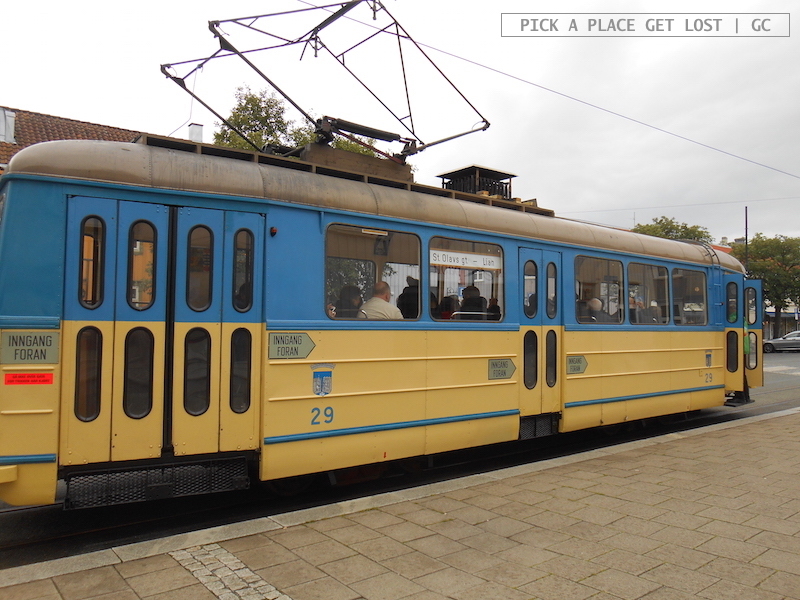 1 to Lian (tram stop at the top of St Olavs Gate, off Kongens gate) or bus no. 10 to Skistua (bus stop in Kongens Gate). 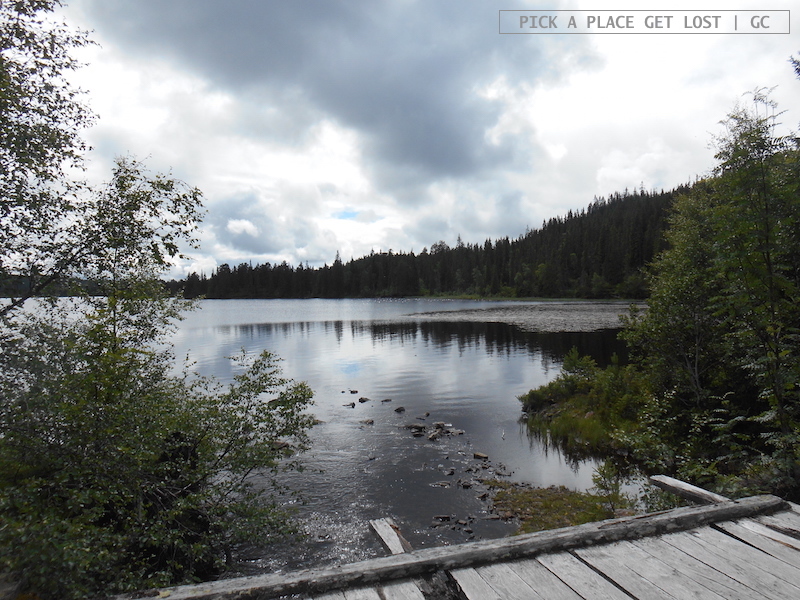 This entry was posted in Norway, Norway 2016 and tagged bymarka, hiking, lian, norway, storheia, trondheim by Giorgia. Bookmark the permalink.